Silverstorm Bengals – Luna was BEST kitten at the Manchester TICA show September 2017! My home bred kitten Luna attended her 1st TICA show run by the London cat show, part of a family pet show, in Manchester last Saturday. Its been some time since I last went to a show and it was lovely to see old friends and new! 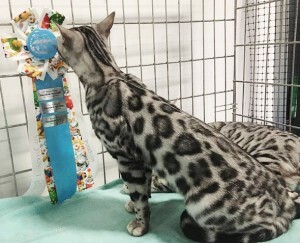 I am thrilled with her results Luna winning 3 Best of breed, and 2 best of breeds and was Best kitten twice in finals and also 5th best kitten.. I would like to say a special thank you to judge Steven Meserve for awarding Luna her Best kitten finals, and recognizing how hard it is to produce such a clear untarnished coat in a silver. He commented on her crazy contrast, glitter and muscular structure. Luna and Ravi were side by side with James Brown and a Street cat named Bob who also attended the pet show! 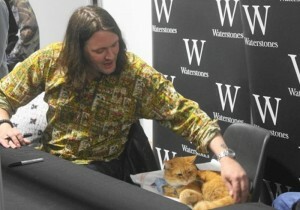 Here they are together signing his books.